This Article is a Part of BTNT Weekly Special!!! Yes, You're right the theme I'm Going to publish today is the same theme which I previously used on Blogtipsntricks.com (BTNT) but it's more advanced than before. After changing to the new theme many bloggers/readers contacted me by asking about my previous design used on BTNT (Some even offered to pay for the previous theme). I haven't even Imagined this many people like the previous design of blogtipsntricks. Thank you so Much. So, Today as the 8 theme of BTNT Weekly Special, I'm Glad to share the previous version of BTNT. 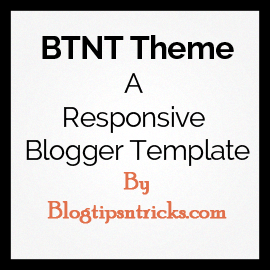 For those who don't know about the Previous BTNT Theme, Its a two column blogger template with Awesome features like Custom opt-in forms (Sidebar, After posts, Above the footer), Ad placement, Social Sharing buttons and much more. You can see a live demo of BTNT below. Go to Blogger Dashboard > Locate your Blog if you have more then one blog. Click on the Upload Button. And you are Done! These are basic steps you need to follow for each customization. After that you will see a Link list items, Customize it your own. After that Add you Adsense code to show ads below post title. To Show Ads after Articles. After that Add you Adsense code to show ads After Blog Articles. After that you will see a Link list items, Customize it with your own social Profile links. There are three Opt-In Subscribe forms in this theme. The username for your feed can be found at the end of your feed URL.For example our feedburner URL is http://feeds.feedburner.com/chandeepsblogtips, with chandeepsblogtips as the username. There is an extra widget which comes along with this theme. It's a social media followers widget (You can see the demo of the widget on the sidebar of this Page named as "Support us"). You can Use this Template for Personal and Commercial Use. you can Re-Distribute but you must give us the credits and you must keep the footer links with out editing! If you like the Template then Please Feel free to Share it! Thanks bro, It's a customized version of zett, Right? Nice. Excellent template. This could inspire me to create something similar for Genesis framework. Is that fine with you? Sure, No problem as long as you don't convert the exact theme as a genesis child theme. Hello chandeep. How to showing single page (without sidebar) or landingpage. like this BTNT? I think design your template kinda Thesis, Kolakube (Thesis skin). but I like you're doing on Blogger Template. lol, It may look like Kolakube because of the header but both have different layout, Anyway I'll keep that in mind and upgrade it in near future. The download link is not working, how oi can download the template? It only showing Thanks for downloading the template but its not starting why? Please reply. If it's still not working then PM me, I'll send it to you through mail. Very nice and good looking template! Yes, It's Possible but I'm Sorry I can only offer support for the theme. You can hire me if you wish to customize the theme. Once again awesome work bro, Can you please share the demo and download buttons coding. Waiting for your positive response !! 3. Why most of your template not having footer widgets part. 4. I personally congratulate you for putting Meta Tags Groups into one part. I really appreciate this tremendous move. But I want to include Meta Description to this group. 6. Whether there is any change to move Title of the Home Page, Posts and Pages Title after the doctype declaration and also I want to move Meta Description to that part. Is it possible to do so? I am waiting for your comment on the above issues. Here are the Answers for your Queries. 1. I don't think so The meta description is there. 2. You're asking me why are you using both microformats and microdata, Right? Currently Google recommends using microdata, and also it also supports the links shared in Google+ but it's still new, On the other hand microformats, even it doesn't have features like microdata its been in use for a long time. so I used both in the template. 3. Noting particular I don't feel like adding it. Also It won't look good for minimal themes. 5. Unfortunately we can only add meta description for each post, meta keywords are only for homepage. hello chandeep can you please help me with modifications of your theme and also some problem which i'm facing with the template like in post i cant find by my name. Loved the whole theme bro but i guess its not responsive.Can you solve this issue bro, make it responsive bro. bro also make this theme available for wordpress also. thanks chandeep for sharing awesome blogger template. i use this template in my blog http://www.newworkingtricks.com . please tell me my web master tool sowing ' not found error ' after install your template. but still see in web server. please declared about query. again thanks and waiting for you answer. First congratulations for the work you have developed here! And for his work that I decided to use the platform blogspot and not recommended for all wordpress bloggers. I wish I knew how to let the width of the smallest post like the model [Camly]? And how can I put a spot for description of similar email with the model [zett] you entered? And finally, how to put the menu bar as your template? I would like to do on pages without the sidebar, how can I do this? Hope I'm not being abusive with my issues is that looked all over your site and found no tutorial for this. This is a nice template for blogger specially that you add customization part that made everything easy. 1. How can I remove the dotted line around where the email subscription form used to be? 2. Is there a better way to translate buttons and such than hardcoding it? 3. Did you ever post the social media followers widget? No category in post ? How could I change the feedburner? i have tried to change the feedburner Id but the subscription always goes to your blog blogtipsntrick on my mail inbox, not my blog. Hey bro in my blog older post can not show with newer post and also do not show comment box under the post.please give me better solution. Nice template man! Pls what about the support us widget? Hi. Why is it sometimes the sidebar widgets are on the lower part? It's really the best template I found for my blog. It's fast loading and also has a clean design. But the custom share buttons do not always appear. I feel naive to ask you this question but currently i am struck with some issues in BTNT theme. 1. I am unable to post article under navigation head as there is no page editor so i cant add link (label) to the navigation head .hope you get my point. 1. Can the navigation tab be provided/changed to a dynamic dropdown. Helpful if you have multiple pages to be displayed. 2. What are your views on feedburner? Is it any useful? I want to Income from Google Adsense. Approval Adsense be able to do with my website. some of your imgur link has been remove in template. can you plz recover it? Hi, in your template. there is some imgur pictures broken. can you fix it please? would appreciate. and search for the following code and remove it. Hi Chandeep. Bingo for the great template. I have a question here. For custom ad below title, we need to put adsense/ad code. What should be the size of that ad. I mean if I put 300x250 ad code, will it work there. Also i am thinking to start a bkig on technology ni he - WordPress guide, make money online, adsense etc. What template you woyld suggest. 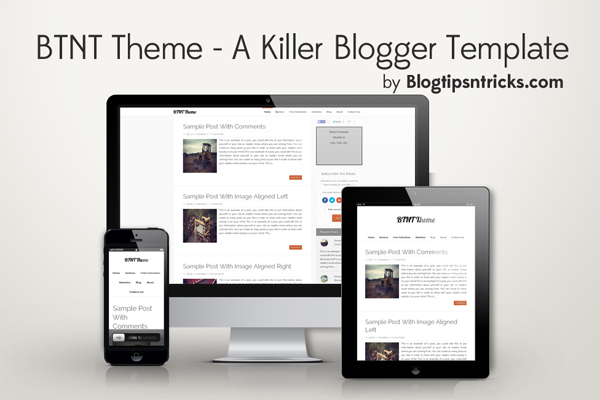 Hi Bro, I am using your theme.. Great to have a such theme for blogger with all the features. Can you Tell me the Code for Labels ( Like Buttons ) . Thanks for BTNT Theme .! Really Hand off bro. Hard work is always unique. I am using your theme now..
chandeep, what's wrong with navigation menu and footer? i've installed this theme a few month ago, but last morning i see an usual change with footer and header. According to your blog, that problems has been fixed. With re-write footer and main nav without widget section..
Now i can't add gadget. Can you help me? I couldn't add hear navigation or footer . How can I show both of them? It's because of a recent update in blogger. Great! It's work. I simple tyep '.' in layout section to which one I wish show up. Thanks a lot. One more thing want to ask for your help: "How can I add a Search box with BTNT style?" But, I don't know, after using it for a couple weeks, the subscribe box widget in sidebar is dissappear. I don't know how to recover it. Can you help me?? It's not because of the theme. it's because of the ad code. To fix it search for async in your ad code replace it with async="async"
Very nice template @chandeep J. Thanks for providing this template to whole blogspot users. Can you point me as how i can edit the template to make the text in the homepage start on another line instead of starting on the side of the post image.